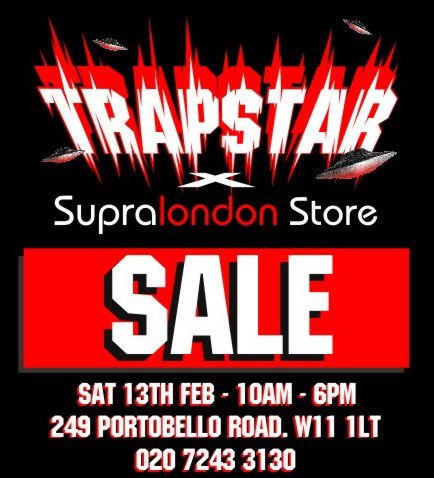 London boys Trapstar are hosting another of their infamous sales, this time in conjunction with Portobello Road boutique Supra. If you haven’t been down to Supra yet, this is a great opportunity to visit the store, well known for supporting the UK street wear scene. 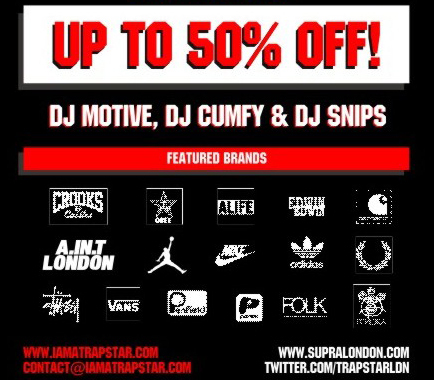 The sale takes place this coming Saturday when you’ll be able to pick up items from a whole bunch of brands, not just Trapstar, with as much as 50% off. All of the information you need is on the flyer above and below, so swing by, listen to some tunes and scoop some bargains.